After our Maundy Thursday service when we’d finished remembering Jesus’ new commandment that we love one another, I hung the evidence of the death of embodied LOVE upon these walls. One of the images, reduced me to tears. I suspect that the image that undid me, lies in each of your minds because this image was beamed all over the world. Every child is the embodiment of LOVE. Every Sunday we talk about the God in whom we live and move and have our being. We trust that we are in God and God is in us. Like Jesus of Nazareth, we proclaim that God is LOVE. Christ is the embodiment of LOVE – in Christ God is en-fleshed. Every child is the embodiment of LOVE. 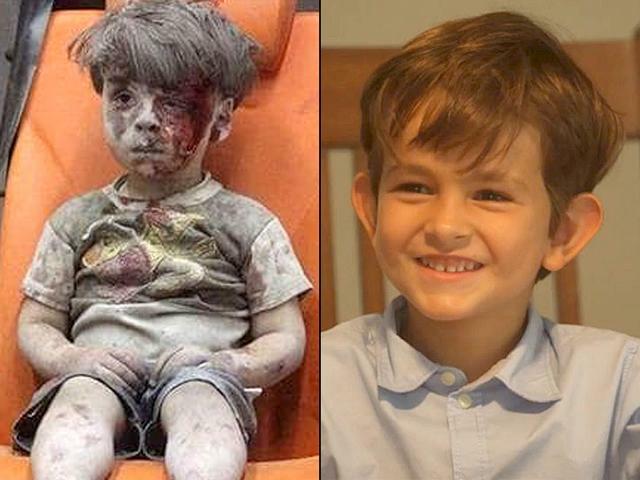 Omran Daqneesh is a child of God, made in the image of God, Omran is the embodiment of the LOVE that is God. When we proclaim that Christ is risen, I believe that we are declaring that LOVE is more powerful than death! I also believe that it is not enough for us to proclaim that Christ is risen because resurrection demands so very much more from us. Now those of you who have been here before at Easter know that I don’t care much for the arguments about what happened to Jesus of Nazareth’s corpse. Like the Apostle Paul when he was confronted with questions like, “How are the dead to be raised up? What kind of body will they have? I too shout from the very core of my being, the words of Paul, who shouted, “What a stupid question!” (1 Corinthians 15:10-11) You see, like Paul, I am convinced that LOVE can only rise from the tombs we put LOVE in, when LOVE is embodied here and now. If our shouts of Christ is Risen are to take on flesh and walk among us, then we must empower LOVE to be stronger than death. For we live and move and have our being in the ONE who is, was, and ever more shall be LOVE. We are in LOVE and LOVE is in us. LOVE is more powerful than death. Death cannot destroy LOVE. LOVE rises from the tomb when LOVE takes on flesh and dwells among us. Why are you looking for LOVE among the dead? LOVE is not dead. LOVE is risen. LOVE is risen indeed. After our Good Friday service, I went home and played with our little grand-daughters. Their LOVE was balm for my troubled soul. Their LOVE moved me from the gloom of Good Friday and so after they went home yesterday, I went back to the tomb in which LOVE had been laid. Sorting through the posters that portrayed embodied LOVE crucified, I was once again undone by little Omran’s tortured image. I couldn’t get his embodiment of LOVE out of my mind and I was determined to find out what has become of this little LOVE. My search for little Omran lead me to another little embodiment of LOVE. His name is Alex. Alex is six years old. Alex is proof positive that LOVE is more powerful than death. Some of you will be familiar with Alex. Alex saw Omran’s picture, and was so disturbed by Omran’s bloodied and bruised image that Alex wrote a letter to the most powerful person he could think of. That powerful man, read Alex’s letter to the members of the United Nations. “Dear President Obama. Remember the boy who was picked up by the ambulance in Syria?” “Can you please go get him and bring him to our home? Park in the driveway or on the streets and we’ll be waiting for you guys with flags, flowers and balloons. We will give him a family and he will be our brother,” Alex says. Alex and Omran are embodiments of the LOVE that we call God. In God, we live and move and have our being. God is in us and we are in God. LOVE is in us and we are in LOVE. LOVE is risen! LOVE is risen indeed. Every child is an embodiment of the LOVE that we call God. LOVE dies whenever a child of God dies. Omran lives. 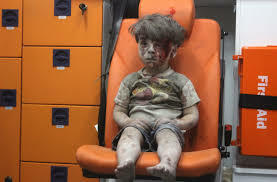 Omran was rescued by the White Helmets. The White Helmets are LOVE embodied in young women and men who rush into the devastation that the violence in Syria inflicts on the people of Syria, rescuing victims from the rubble. Omran was reunited with his family. Sadly, a few days after Omran was rescued his ten year-old brother Ali died from his wounds. 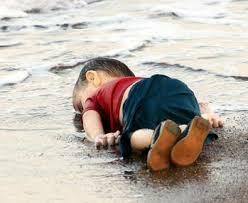 Like little Alan Kurdi, whose tiny body washed up on the shores of the Mediterranean and captured the world’s attention – LOVE dies. But, members of little Alan’s family made it to Canada and are now living in Coquitlam BC. I do not know what will become of the surviving members of Omran’s family, or indeed of the people of Syria, or of the countless other embodiments of LOVE that are crucified over and over again. I only know that: LOVE is more powerful than death. LOVE rises wounded from the tomb. The wounds are all too visible. These wounds are ours to tend, for Christ has no body now but ours. Our hands are Christ’s hands. LOVE’s wounds are ours to tend. LOVE is risen. LOVE rises when embodied LOVE takes on flesh and dwells among us. Just as surely as crucifixions happen all the time, resurrections happen each and every day. “I deny the resurrection of Christ every time I do not serve at the feet of the oppressed, each day that I turn my back on the poor; I deny the resurrection of Christ when I close my ears to the cries of the downtrodden and the oppressed. Every time I do not serve my neighbour, every time I walk away from the poor. I deny the resurrection every time I participate in an unjust system. LOVE is more powerful than death! LOVE is Risen! LOVE is Risen Indeed! Alleluia! LOVE rises when embodied LOVE takes on flesh and dwells among us. Let us be LOVE in the world! 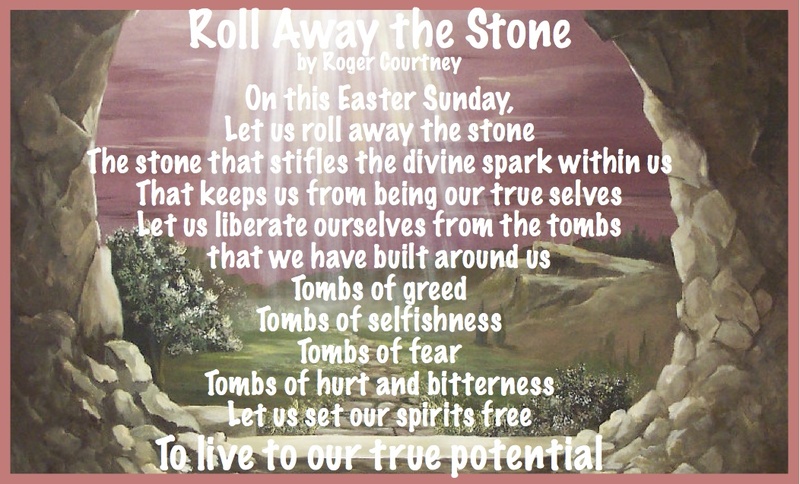 This entry was posted in Evolutionary Christianity, HOLY CROSS LUTHERAN, Progressive Theology, SERMONS, STORIES, Theology and tagged 1 Corinthians 15:1-11 progressive sermon, Easter sermons, emergent theology, evolutionary christianity, Lutheran Easter Sermon, Omran Daqneesh, Peter Rollins resurrection, progressive christian easter sermon, progressive christian spirituality, progressive christianity, progressive Easter sermons, progressive theology, resurrection stories by Rev. Dawn Hutchings. Bookmark the permalink.